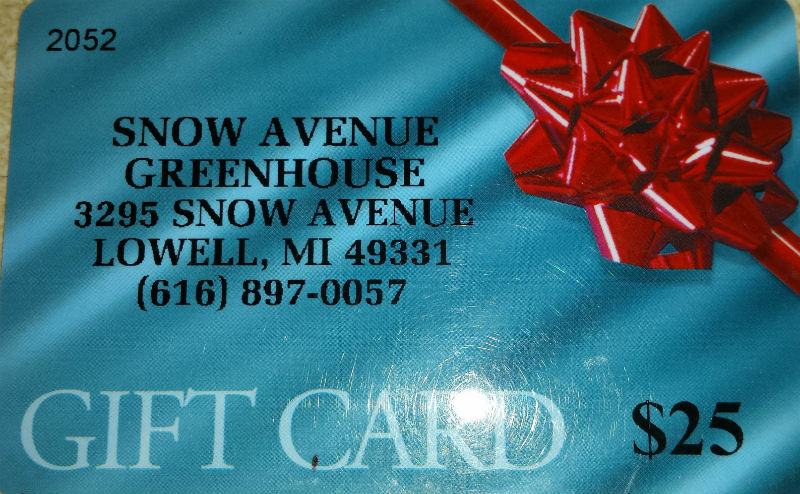 Thank You for choosing SNOW AVENUE GREENHOUSE for your spring flower needs! We are making it easier for you to give flowers to your friends and loved ones by simply buying a gift card on line using your Visa or Mastercard. Make your purchase and we will mail the card to you or to the address of your choice. We'll try to get them out in 3 days or less so you will be assured of prompt delivery. We will email you a receipt of your transaction so you'll know your order has been processed. Gift cards are available in increments of $25 and $50. they can be used all spring on all our sale and coupon items to make your savings even greater. Gift cards may be used only during our regular retail business hours when we open in April through August. Gift cards may not be redeemed or returned for cash or refunded for credit at anytime.